Bret Layman is a fourth generation dairy farmer from Licking County. 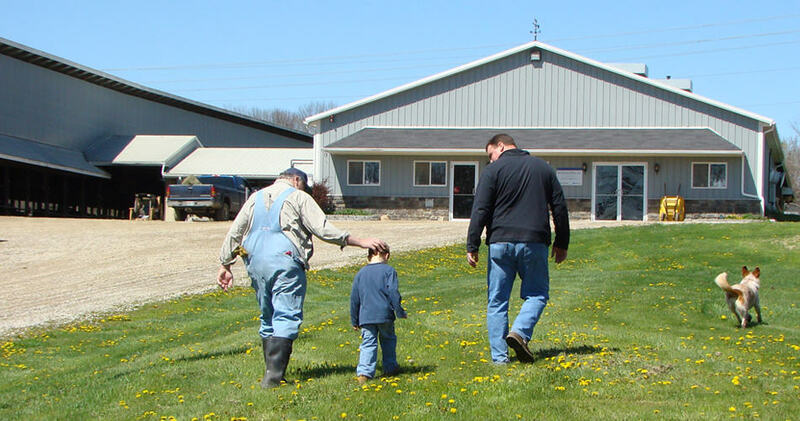 Together with his wife Kelley and family, they care for their 200 dairy cows at Layman Dairy. The Laymans are always striving to provide their cows with the best care and produce the highest quality of milk possible. What does dairy farming mean to your family? Bret: Dairy farming is our passion. It’s our way of life, it’s what we know, and it’s what we enjoy. There have been tough times in the dairy industry, but there has never been a morning when my alarm has gone off at 3:30 a.m. and I thought “I do not want to go to work today.” I get up, and I still enjoy it. We’re going to take care of the land, we’re going to take care of the cattle, and we’re going to take care of each other. And in the process, we’re going to help feed the world. Bret: People often talk about being green as the “hip” thing to do, but as farmers, we’ve been green for as long as we’ve been farming. Just as you treat people the way you want to be treated, you treat the land the way you want it to treat you, and we want the land to treat us well. We don’t do anything to harm the land or our streams. We handle manure in the most environmentally friendly manner possible, and we take advantage of any new technologies that can help us to be greener. We do everything we’re required to do and even beyond that, we do everything we can do to protect the watershed. In the summertime, our kids play in the same water that runs through this farm, and we want to be sure it’s not polluted. But whether they’re playing in it or not, we’re always going to take special care of it. How do you produce high-quality milk? Bret: Milk quality starts at the farm. We wear gloves to keep the cows clean when we’re milking them in the parlor and we sanitize the teats with iodine before milking. The equipment is always clean, and once the milk leaves the cow, it’s sealed within the hose, the milker and the pipes. We want to make sure the milk stays in a sealed environment so it’s free from any bacteria or contamination. We’re always after a better product. Quality is monitored very closely to make sure the end consumer has the best possible product.